Labelled the choice of the unadventurous restaurant diner it can often be overlooked as a ‘serious’ meat, but this familiar and safe protein can be made exciting. The neutralness of chicken means it’s well placed for taking on other flavours and textures, so layering up other ingredients can work very well in creating interesting dishes. 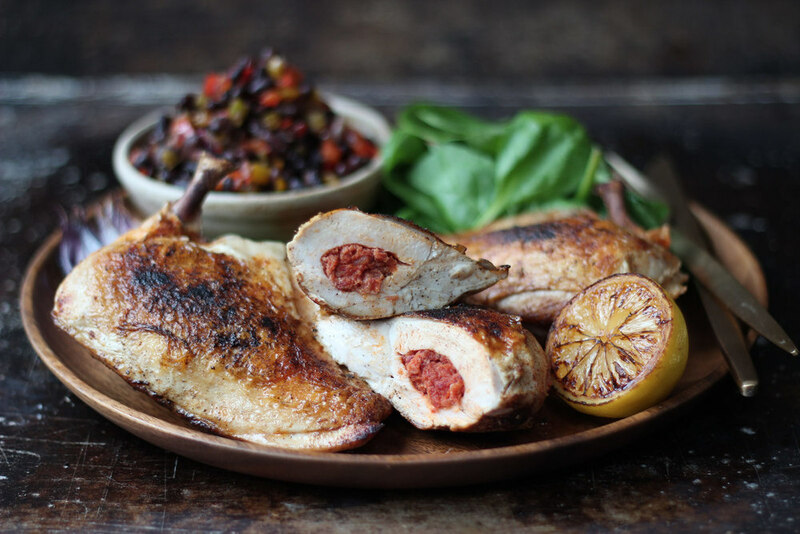 Chicken and chorizo is a well known match, and here I’ve chosen to stuff the chicken with chorizo heavy on the smoked paprika to help flavour it from within, and to serve it with a warm salad of black beans with jewel-like peppers, lemon and olive oil. Whether cooking this or any other chicken dish sous vide or conventionally, I can’t recommend brining highly enough. A four hour stint in a standard 10% brine really helps keep the chicken plump and juicy during cooking. And in terms of the cooking method, chicken was made to sous vide. With good quality free range chicken cooked in my water bath from SousVideTools.com, all the chickens flavour was retained during the gentle 90 minute cooking because what goes in the bag stays in the bag. There’s nowhere for the delicious juices to evaporate off to from the sealed pouch — everything is kept inside the flesh, so when you cut in to it it’s soft, succulent and tender in a way conventional cooking sometimes struggles to deliver. I decided to try it out on some of our super foodie friends recently. They loved it and were very surprised at the flavour and succulence of the chicken. So much so we ate the wings with our fingers, making sure to get out every last morsel of meat. Given the discerning nature of our guests that evening, I’d say that was a result in chicken liken’s favour — with the right ingredients and cooking method the little bird can be anything but ordinary. Mix the salt, sugar and water together until dissolved and brine the chicken breasts for 4 hours. Preheat your sous vide to 64°C. Take your brined chicken supremes and place them in front of you with the thickest end (where the wing is) facing you. Using a slender sharp knife, and with one hand on top of the chicken holding it down, slide the knife into the chicken breast to create a pocket, carefully opening the pocket out with the tip of the knife — remove and turn the knife over and do the same again inside the pocket, opening out the other side — you want to create a cavity but not open it up too much at the opening. Repeat with the next. In a food processor, place the chorizo and bacon and blitz until smooth and combined. Take the chorizo in teaspoon sized pieces and roll into a little sausage shape and push them inside the chicken breast, forcing the stuffing right into the cavity, piece by piece until you’ve really filled up the centre and the breast is super plump looking. Repeat with the next. Place into individual sous vide pouches and seal on a hard vacuum, taking care to smooth out the skin over the breast, place into the chamber for 90 minutes and chill down as usual once ready — half way through the cooking is time to get the beans cooking. While the chicken is cooling down, preheat your oven to 180°C and pop a baking sheet in to heat up. In a frying pan with a little olive oil on a high heat, fry the peppers and onions together for around 6 minutes — you want them to soften a little and to begin to catch at their very edges. Remove from the pan and place into a large mixing bowl, add the lemon juice and a very liberal glug of extra virgin. Take the cooked beans that have been drained and add them to the peppers, stir to combine and season with salt and pepper to taste — they’ll take a fair amount of salt, adjust the lemon and olive oil if needed. Take the chicken supremes out of their pouches and pat dry with kitchen paper, then lightly dust the skin side with smoked paprika and sea salt. Heat in a frying pan a large knob of butter and glug of groundnut/vegetable oil and when it foams, add the chicken breast side down. Cook for 4 to 5 minutes until the skin is golden and crispy. Season the other side with black pepper and salt and turn over in the pan, cooking for another 2 minutes. Take out of the pan and place skin side up on the heated baking sheet and place into the oven to cook through for 5 minutes. Serve with spinach leaves, the warmed bean salad and charred lemon wedges.